Has your family thanked a farmer yet this week? During the month of February, kids can download a "love letter" to give to their favorite vendor at the Manhattan Beach Farmers Market. When they stop by the information booth with the letter, they can get a free $1 "carrot coin" to spend at the market. The "love letter," created by the Manhattan Beach-based Growing Great, can be downloaded here. Kids can turn in the letters at the market throughout the month of February. The Manhattan Beach Farmers' Market is open from 11:00 a.m. to 4:00 p.m. on Tuesdays at Metlox Plaza. 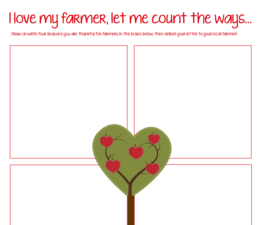 According to Growing Great, writing a "love letter" to a farmer will reinforce the critical idea of eating fresh, local and close to the source food - a lesson that is reinforced throughout the Growing Great curriculum. Kids and parents who participate in the letter-writing process are urged to snap a picture of the letter and send it to info@GrowingGreat.org, or share them on Facebook or Instagram with the hashtags #GrowingGreat #loveyourlocalfarmer and #manhattanbeachfarmersmarket . GrowingGreat is a nonprofit school garden and nutrition education organization dedicated to inspiring children and adults to adopt healthy eating habits. Its goal is to help children and families understand where their food comes from, appreciate that food serves a purpose in their overall health, and has an impact on our longevity and well-being. Founded in 1999 at an elementary school demonstration garden in Manhattan Beach, it has since expanded nationwide and has served more than 150,000 students and families. Growing Great is also one of the recipients of proceeds from the Manhattan Beach Farmers' Market.